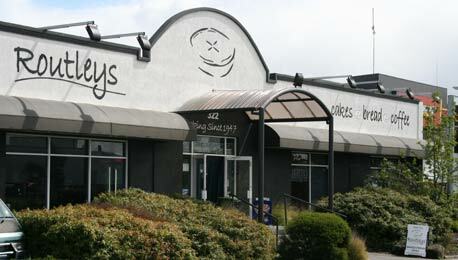 Routleys'' Bakery''s flagship store at North Geelong. A local family has made Routley’s Bakery synonymous with the Geelong region for more than 60 years. With a well-deserved reputation among other local families for beautifully baked goods, Vic and Verna Routley first started baking in 1947. The couple grew up in Geelong but the original Routley’s store was in Nelson Place, Williamstown. After World War II the couple moved to Williamstown where Vic worked as a baker. He and Verna decided to buy the shop where he had been working and began operating it together. The couple’s working days began at midnight when they stoked up their big brick-lined Scotch oven, fired with wood or briquettes. They would put the pies in first when the oven was hottest, followed by cakes and then the delicate sponges. In 1971 Vic and Verna handed on the baton to their son Lawrie and wife Anne. The couple expanded the business to its present state with the help of their five children: Simon, Penny, Michael, Kate and Sam. The Routley family’s eldest great-grandchild, Michael, now works for the business. Routley’s has a firm reputation as one of Geelong’s best bakeries but stands apart from the field for the quality of its pies in particular. The big variety covers ingredients ranging from prime beef, veal and chicken through to tuna and vegetarian options. Wholemeal options are available, along with poplar Cornish pasties, sausage rolls, bread, sandwiches and much more. Routley’s operates nine outlets, including shops at Lara, Torquay, Colac and around Geelong. A catering service is also available, offering an ideal option for corporate events, family gatherings and club functions. Routley’s flagship North Geelong shop is open 6.30am to 5pm Monday to Friday, 7am to 4pm Saturdays and 9am to 4pm Sundays at 322 Melbourne Road. The North Geelong bakery offers daily specials covering everything from pies and cakes through to bread and rolls. Customers are invited to speak with staff about Routley’s delicious range of special-occasions cakes. The bakers can even make exotic chocolate croquembouches. More information about the company and its products is available at routleysbakery.com.au. Routley’s also invites customers to like its Facebook page to keep abreast of the latest specials.